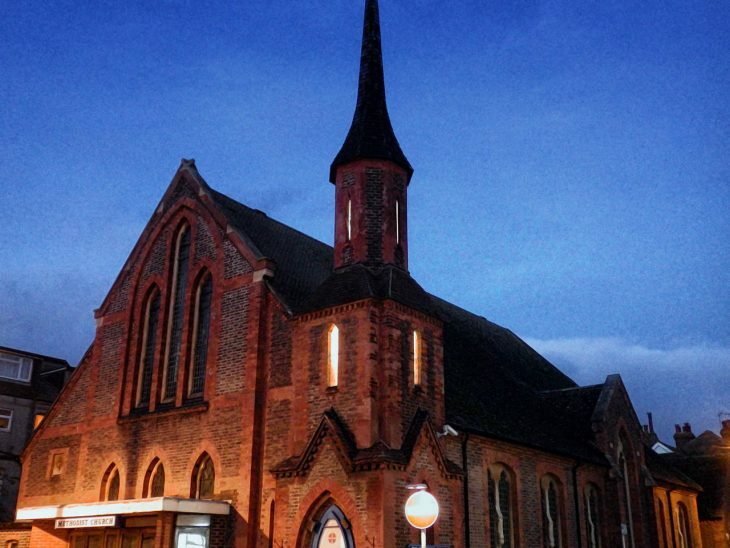 Bexhill’s Methodist Church in Sackville Road had an early Christmas gift this year – the night-time illumination of its tower. The project was commissioned by Methodist Minister, Reverend Tricia Williams, and completed by volunteers from Bexhill Heritage. “This was quite an unusual job for us”, said Steve Johnson, Vice-Chair of Bexhill Heritage, “First we needed to pigeon-proof the tower and remove years of accumulated droppings from inside. Once the ‘big clean up’ was completed, we found the tower to be in very good condition and it was relatively easy to install lighting”.